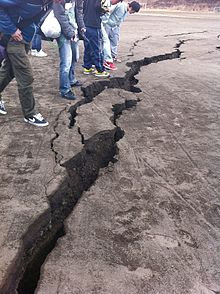 This Saturday, July 23rd, Japan was hit with another earthquake, this time a 6.5 on the Richter scale and yet again it hit in the same area that was previously devastated by the giant 9 and the huge tsunami. In that quake and tsunami over 22,000 lives were lost. Significant with this latest earthquake is yet another split in the earth. If you are interested in following the complete Fukishima story and ongoing crisis, you will find daily reports HERE. The dire and terrible situation for northern Japan is not over yet by a long shot. Release the bochurim and this will end. Hard times for the earth as this is not an isolated incident. The earth itself is undergoing some heavy changes which include pole shifts.